I’ve been watching the Instagram feed of longarmer Karlee Sandell (SewInspired2Day), who has quilted several quilts for me. “Swan Song,” a quilting design she used recently, was on my short list for this quilt. After consulting with Karlee, it moved to the top of the list. Can you see how the curves and circles in the quilting design mimic the curves and circles in the prints? The effect is so lighthearted and whimsical. Let me show you a couple of close-ups. Here’s a positive block (black print on white background) . . .
You may not realize it but the thread I picked isn’t white, it’s a very pale grey. I knew it would give definition to the quilting on the white background without being too strong. Likewise, I knew the grey thread would slightly soften the impact of the quilting on the black background. Perhaps you can see that if you go back and look at the two blocks above. Originally I was thinking about custom quilting for Checkerboard Curves. I would have gone with black thread in the five negative blocks and white in the four positive ones. Know why I didn’t? The back of the quilt! I liked the print so much I didn’t want to cover it up with dense patches of black thread. When trimming the quilt I left a quarter-inch margin all around. 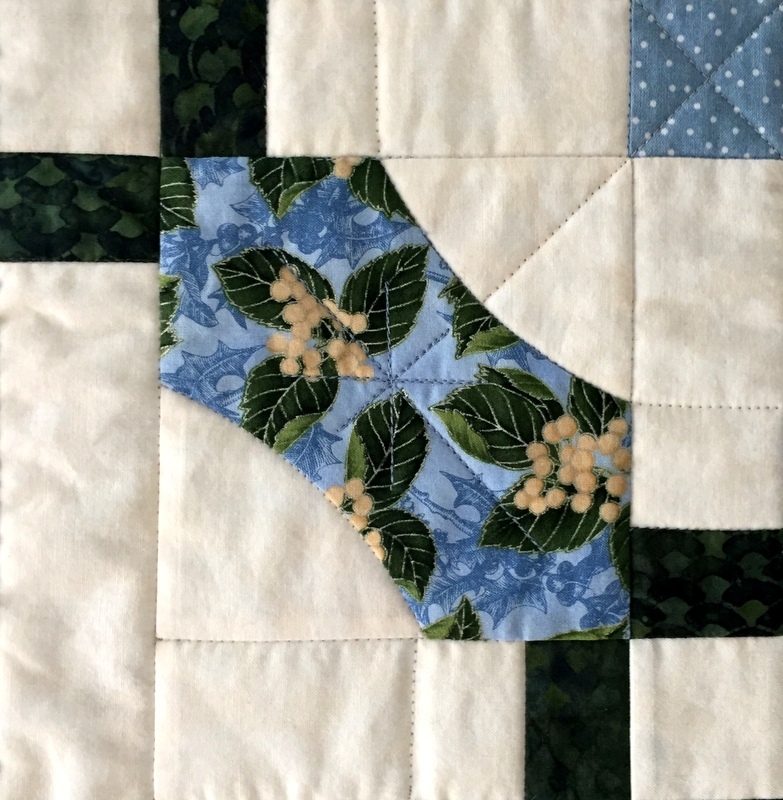 That’s because I’m going to frame the quilt with half-inch binding in solid lime to match the half-inch wide strips in the center of each block. With the binding added Checkerboard Curves will measure about 44″ square. I may go with a lime green label, too, just for the fun of it. First the back story, then the tutorial. Mini Mod Tiles, about 34″ Square, made by Sew Kind of Wonderful (2017). Photo used with permission. Piccolo Terrazzo Tiles, 34½” Square. Made by Dawn White, Quilted by Karlee Sandell. Terrazzo Tiles, 63″ Square (2017). Made by Dawn White, Quilted by Karlee Sandell. Two Versions of Mini Mod Tiles: Original and Supersized! The SKW sisters graciously gave me permission to show how I supersized their pattern, hence this tutorial. My directions will be easier to follow if you have already made a quilt using the original Mini Mod Tiles pattern. This tutorial has two parts. Part 1 is a two-page handout showing fabric requirements and advance cutting for both a scrappy version using multiple prints like the original SKW version and the more controlled version I made with just four fabrics. Download Part 1: Fabric Requirements and Advance Cutting. Required: Quick Curve Ruler by Sew Kind of Wonderful (available at many local quilt stores and at Sew Kind of Wonderful’s website). Required: free pattern Mini Mod Tiles, downloaded from the SKW website. Study the directions carefully. The cutting, sewing, and squaring up instructions are almost the same as for the mini. The main differences are the cut sizes of fabric and the fact that you are using the original Quick Curve Ruler. Refer to the illustrations on the pattern marked Sample 1, Sample 2, etc. “A” shapes, cut from 8″ focus fabric squares: Referring to Sample 1, measure and make registration marks at the midpoints of the outside edges (4″ from the corners) of all four sides of a square (Sample 1). Refer to Sample 2 illustration showing the position of the QCR on the fabric square. The red dashed line indicates the curve cut-out you follow with your rotary cutter. You can see that the cut-out curve is right over the registration marks on the left and bottom sides of the square. First Light Designs tip: Note that the curve cut-out in the QCR is about ⅛” wide. Rather than centering that ⅛”-wide channel over your registration marks, position the ruler so that the inside edge of the channel is right over your registration marks. When you make your cut, follow the inside edge of the channel with your rotary cutter just as you would when making a cut with a straight-edged ruler. Your cut curves will be more uniform in size. After making the first cut, rotate square 180º and repeat on other side. Repeat with remaining squares. Total: 36 A shapes. By the way, don’t discard the leftover curved pieces! They are a great size for appliqué or paper piecing projects or can be cut into 2¼” or smaller squares for another quilt. “B” shapes, cut from 5″ x 8″ rectangles: Measure and make registration marks 3″ in from the top left edge and 3″ in from the bottom right edge. Refer to Sample 3 illustration. Note that the ruler is positioned so that the dotted red line showing the cutting channel goes from the upper left corner of the fabric to the registration mark on the bottom right side. After making the cut, rotate the block 180° and repeat. Discard the slivers of leftover fabric. Did you know? You can stack your squares and rectangles and cut multiple units at one time if your rotary blade is very sharp. Try cutting two layers first. If that works, try up to four. Referring to Sample 4 and Sample 5 illustrations on page 1 of the pattern: See the arrow pointing toward the 1/4″ that Piece B extends beyond Shape A? Change that measurement to 3/8″. When you position Shape B on top of Shape A, right sides together, be sure the tip of B extends 3/8″ beyond the tip of A. Press seam toward A. Note in Sample 4 how the edges of Shape B extend beyond Shape A at the curved seam. This is what you want, as the excess fabric is trimmed when the block is squared up. With two B shapes sewn to a shape A, the unit is now called AB. Referring to Sample 6 on page 2 of the pattern: Square up AB unit to 8″ square. Using an 8½” or larger square ruler, position the ruler so that the straight edges of AB (upper left and lower right corners of the block) measure 8″ square. Trim right side and top. Rotate block 180º, reposition ruler so that bottom and left side of block are on the 8″ lines of the ruler, and trim right side and top. Repeat with remaining squares. Follow the directions, keeping in mind that your (60) C units are made with connector pieces measuring 2½” x 3″ and sashing strips measuring 3″ x 6″. Likewise the D units are made with two C units and a 3″ square of background fabric in the middle. Note: it would be more efficient to make these C and D units in strip sets but I decided to match my tutorial as much as possible to the original directions. Follow pattern directions, keeping in mind that the center of the block is a 3″ square of accent fabric, not a 2″ x 2″ background piece. Make (9) blocks which measure 18″ square. I did deviate from the pressing directions. Instead of pressing seams open where directed, I always pressed toward the focus fabric, even when sewing rows together. Why? I was planning ahead, in case I wanted to stitch in the ditch around my focus fabric. It’s very difficult to do that when a seam has been pressed open. As it happened, I decided to have both quilts custom quilted; the longarmer stitched in the ditch on both quilts at my request and I really like how much extra definition the stitching gave to the focus fabric shapes. If you have any questions, please feel free to ask. And if you make a supersized version of Mini Mod Tiles, I would love to see a photo. I know the Sew Kind of Wonderful sisters would, too!